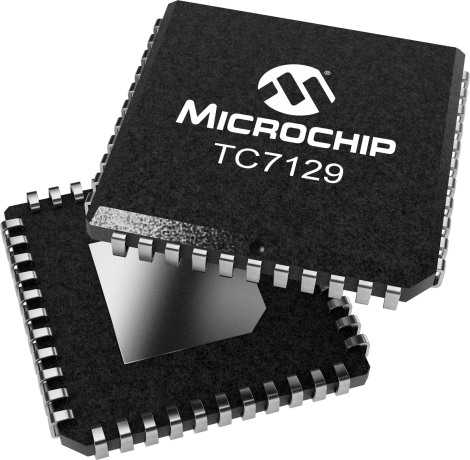 The TC7129 is a 4-1/2 digit analog-to-digital converter (ADC) that directly drives a multiplexed liquid crystal display (LCD).Fabricated in high-performance, low-power CMOS, the TC7129 ADC is designed specifically for high-resolution, battery-powered digital multimeter applications. The traditional dual-slope method of A/D conversion has been enhanced with a successive integration technique to produce readings accurate to better than 0.005% of full scale, and resolution down to 10µV per count. The TC7129 includes features important to multimeter applications. It detects and indicates low-battery condition. A continuity output drives an annunciator on the display, and can be used with an external driver to sound an audible alarm. Overrange and underrange outputs and a range-change input provide the ability to create auto-ranging instruments. For snapshot readings, the TC7129 includes a latch-and-hold input to freeze the present reading. This combination of features makes the TC7129 the ideal choice for full-featured multimeter and digital measurement applications.